Placing start/finish line with the arrow pointing in a direction other than right results in incorrect spawning of cars. Support for 1-4 player races and 1-8 players in elimination, local only. Supports Keyboard and Gamepads. Any feedback is welcome and much appreciated, I'm trying to work out what is fun and what isn't. Also reporting any bugs you find would be great. I work alone, and it's hard to judge and test every part of the game well. 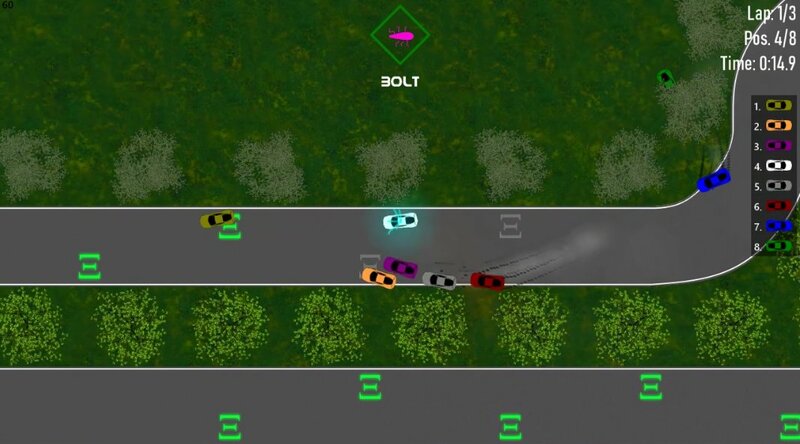 Currently the game is a Work In Progress, however the aim is to have a detailed editor allowing you to create your own race tracks, which you can then race on with your friends or against computer-controlled opponents, or a combination of both! Pre-built race tracks will be included with the game, for those of you who don't want to spend the time designing your own. Level sharing will also be available, meaning you can download the best tracks made for the game, and upload your own to be played by the community. There will be a variety of game modes in the game, including circuit racing, elimination, drfit and time trial. The game will be playable 1-8 players locally (Some gamemodes only), or over the internet. Please note that not all features are currently available, as the game is in alpha stage. I'm releasing this now in order to gain as much feedback as possible, in order to create an improved game, as I work alone and it's hard for me to judge how the game is progressing. ----------------------------------------- 0.1.2 - Released 19th January 2019 ----------------------------------------- ADD: Lighting system has been added to the game. ADD: Headlights have been added to cars. Press F to toggle. ADD: Weapons now have lighting associated with them. ADD: Weapon pads now have lighting. ADD: Time of day selection has been added to lobby. FIX: Not every tree is a Sakura tree. FIX: Game could think there was 1 additional player. FIX: Crash related to unimplemented gamemode in split-screen. FIX: P1's screen should now be displaying correctly in split-screen.